Kovakka Thoran is a healthy and tasty thoran/ Side dish to have with rice. This special ‘Kovakka Thoran’ preparation has no turmeric and is easy to prepare. Kovakka or Ivy gourd is a favourite vegetable in my family. When I was young, we had kovakka vine in our back yard and I remember plucking just enough Kovakka to make thoran. I try all possible dishes with Kovakka; It is tasty and healthy too. My parents have ancestral roots in Pala where this Kovakka Thoran is almost always in the menu. Almost all the houses have Kovakkai in their garden and is a very common vegetable in the region. The health benefits of this wonder vegetable are many, apart from controlling the blood sugar levels. 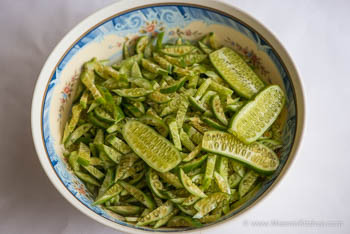 Stir fried Kovakka or Kovakka Mezhukkupuratti, Kovakka Fry and Kovakka thoran are all tasty dishes that can be prepared with Ivy Gourd. While most of the Keralites are familiar with Pavakka fry, Kovakka Fry is still not very popular in many regions. 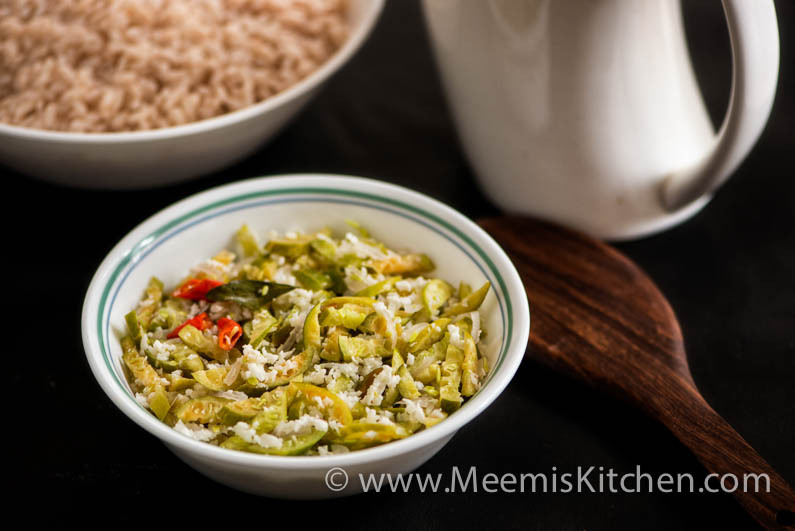 Thoran or vegetables cooked with grated coconut is a must side dish for Kerala lunch. Check out my other wonderful thoran recipes like Beans Thoran, Peechinga Thoran, Cabbage cherupayar thoran, Vazhakoombu Cherupayar thoran, Padavalanga carrot thoran, Cabbage Irachi thoran etc. You may find a variety of ways of preparing Kovakka Thoran in Kerala. This recipe for Kovakka Thoran is quite simple and does not require oil, but if you mix ½ tsp coconut oil after cooking, the flavor and aroma is just awesome. The unriped ones are the best for cooking, as the ripe ones have a sour taste. Try this healthy Kovakka Thoran and enjoy with rice. Wash and cut kovakkai lengthwise; split into two or three pieces and cut horizontally again into smaller pieces. Cut the green chillies into rounds and chop onions finely. 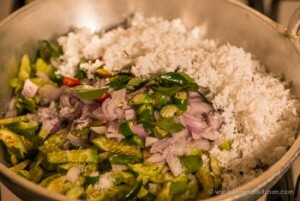 Mix well all the ingredients with coconut and enough salt in a kadai. Cover and cook on low flame. Stir in between. No water is required. Cook till well done. If you are keen on adding coconut oil, add ½ tsp – 1 tsp after the flame is switched off. Mix well. There, your healthy thoran is ready. 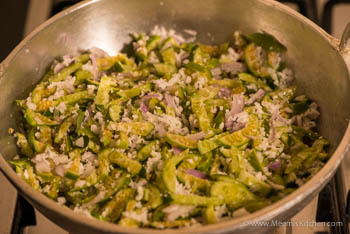 You can substitute onion with small onions, add plenty. Adding coconut oil is optional, though I recommend doing it, as it adds good flavor and Aroma to the dish. No water is required. Cook in a small flame and stir in between. Cover and cook. Kovakka (Ivy gourd) is considered as a therapeutic herb in Ayurveda. It is a suggested food for diabetic patients because of its blood sugar controlling properties. It is loaded with vitamins and has nurturing effect on your eyes, heart, liver and kidney. During fever, it is recommended to have this veggie with your meals. Enjoy healthy Kovakka thoran with rice. God Bless!